Home Uncategorized	Sunlight exposure or vitamin D supplementation to lower cholesterol levels? A surprise. Recent research enlightened me to a paradox in cholesterol research. It appears that vitamin D supplementation actually raises total cholesterol (TC) levels and “bad cholesterol” levels (LDL). Supplementation is also associated with a small rise in “good cholesterol” levels (HDL). The paradox lies in the fact that sunlight exposure is associated with a decrease in total cholesterol levels and LDL, while also producing a small rise in HDL. In both cases, vitamin D levels are raised significantly. The research, from India, was born of a concern that although India has abundant sunshine, vitamin D deficiency is common, because so many do not take advantage of sunlight exposure. 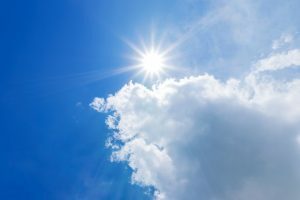 The researchers decided to determine whether it was better to use sunlight exposure to increase vitamin D levels, or to instead use vitamin D supplementation. To do this, they formed three groups: a control group that had “normal” levels above 50 nmoL (20 ng/ml), and two vitamin D-deficient group with levels below 50 nmoL. One of the vitamin D-deficient groups increased their usual sunlight exposure by at least 20 minutes to their face and arms between 11 AM and 3 PM daily. The other deficient group received oral supplements of 1,000 IU of vitamin D (cholecalciferol), but did not increase sunlight exposure. The researchers also measured cholesterol levels. The study lasted for 6 months and the results were as described above: A decrease in TC level and LDL levels in the sunlight exposure group, an increase in TC and LDL in the supplementation group, and an increase in HDL in both groups. It would have been interesting if the subjects in the sunlight-exposure group had experienced full-body exposure for 20 minutes, which can produce up to 20,000 IU of vitamin D; a few minutes on the face and arms is not sufficient to optimize vitamin D levels. Equally, the use of 1,000 IU daily of vitamin D is miniscule. I would have suggested at least 4,000 IU daily. Altering upward the dosages of both sunlight and vitamin D could have shown larger differences. More research needs to be done to determine whether or not these results can be replicated. The indications of this study is that vitamin D supplementation may be harmful because it raises serum lipids in an adverse manner. There is also an indication that sunlight exposure improves lipid profiles while still raising vitamin D levels. By what mechanism would sun exposure lower cholesterol levels? A type of cholesterol precursor called 7-DHC is stored in the skin. It is also used to produce vitamin D when under the influence of sunlight. Regular sunlight exposure would reduce this cholesterol store and thereby reduce cholesterol levels. As to why vitamin D supplementation might increase cholesterol levels, it could be due to the fact that it is usually made by radiating lanolin from sheep. Animal products are known to raise cholesterol levels. Whatever the reasons for the ability of sunlight to lower cholesterol levels, this study is one more indication that sunlight is a friend to nearly every system of the body. Be sure to obtain plenty of non-burning sunlight. Your heart and brain will thank you for it! I will hunt it down but was curious for the reference as to the study referenced in this article. I am currently writing a book on Vitamin D and one aspect is concerning cholesterol as you astutely point out is the precursor for cholecalciferol, the form of vitamin D3 formed in the body. In my book I have made this connection also. I happened across your article in looking for information concerning sun lights effects (in particular Ultraviolet lights destructive effect on these molecules) on blood levels of either or both calcifediol, the form of vitamin D3 measure in the blood to determine our levels and cholecalciferol the form we produce in our body’s with the help of UVb. Sorry I didn’t pick up your comment until now. I’m not sure why the reference was missing, as it is my wont to reference everything I write. Here is your reference: Vivek G. Patwardhan, Zulf M. Mughal, Raja Padidela, Shashi A. Chiplonkar, Vaman V. Khadilkar, and Anuradha V. Khadilkar. Randomized Control Trial Assessing Impact of Increased Sunlight Exposure versus Vitamin D Supplementation on Lipid Profile in Indian Vitamin D Deficient Men. Indian J Endocrinol Metab. 2017 May-Jun;21(3):393-398.